The Mad Elf Mouse is an Event Mouse found during the annual Great Winter Hunt event. To ensure his victory, the Mad Elf Mouse has created a protective field to disable much of a hunter's equipment. Only a powerful arcane trap will be able to disable the field and potentially capture him. Information on how to locate and capture the Mad Elf Mouse can be found on the current Great Winter Hunt location page. Loot: Gnawnia Winter Gift, Ice Coin, Scarf Parts. 20 December 2011: The Mad Elf Mouse is released as part of the Great Winter Hunt 2011 event. 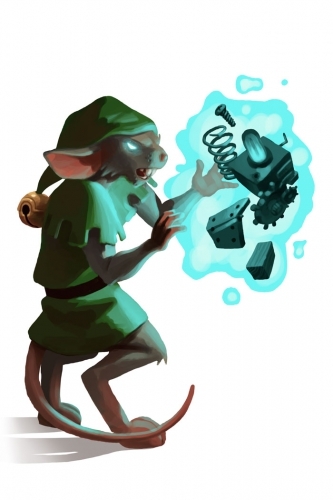 25 June 2013: The Mad Elf Mouse gained a vulnerability to Law power type traps, with the release of Varmint Valley. To ensure his victory, the Mad Elf Mouse has created a protective field to disable all equipment other than his own toy technology, including a hunter's trap. Only a trap made of toy parts will be able to maintain power and potentially capture him. 9 December 2014: The Mad Elf Mouse had its weaknesses adjusted and now has some weakness to all power types. 13 December 2016: The points/gold for Mad Elf Mouse were changed.